Google Goggles: Bad for Business? Google's limited launch of its Goggles visual search app has plenty of people wondering when they'll be able to try out the new tool. Google Goggles, released to Android users on Monday, allows you to search on your cell phone simply by snapping photos: You point your phone's camera at a place or object, and it delivers detailed information to you within seconds. So far, the Goggles app is available only in the Android Market, leaving iPhone and BlackBerry fans empty-handed. But there's good news today for the non-Android crowd -- it'll just require some patience. I confirmed with Google this morning that the Goggles app will indeed reach other platforms. You may not want to hold your breath, however, for the Android exclusivity to end. "It is our intention to quickly develop Goggles for the most popular mobile handsets and platforms," Google's Katie Watson tells me. "Unfortunately, we don't have a specific timeframe to share." Bear in mind that Goggles is currently categorized as an experimental Google Labs product; it's still in testing and actively being developed. It would make sense, then, to assume that Google might wait until the app is considered more robust and finalized before it expands its availability. Already, engineers have hinted at some of the development still underway with Goggles, saying that this early edition only "scratch[es] the surface of the visual search technology." 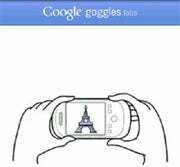 Google Goggles presently works best with nonliving objects -- things like books, DVDs, and other products -- and with landmarks and other physical locations. Food, cars, plants and animals aren't presently among the program's strengths. "Today Goggles recognizes certain images in certain categories, but our goal is to return high-quality results for any image," explains Vic Gundotra, Google's vice president of engineering. Future innovations described by the Goggles team include the ability to identify a plant by photographing its leaf, or even the ability to get advice on a chess game simply by snapping an image of a board. As for any specifics on Goggle's future roll-out to other platforms -- what systems might be supported, how the app will be packaged outside of Android -- Watson says it's too early to state anything definitive. Just keep your fingers crossed that whenever the time does come, your platform of choice doesn't ban Google from its shelves (Google Voice for iPhone, anyone?). In the meantime, you can check out this hands-on tour for a detailed look at Goggles and how it works. I suspect you'll be pretty impressed with what it can do.